Few pieces in your kitchen get more use than the faucet. You wash hands, wash food, wash dishes, fill pots, etc. The list is long. Therefore, the faucet needs to be able to withstand heavy use. Style details aside, there are two basic configurations for faucets, a single handle and side handles. A single handle is just that, one piece that turns on the water as well as adjusts for hot and cold. 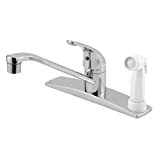 Side handles consist of a three-piece faucet with a waterspout that is flanked with handles or knobs, one for hot and one for cold. These designs have fallen a bit out of favor in recent years, and ConsumerReports.org found that they tend to be more awkward to use. 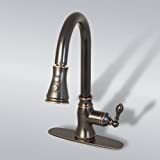 Kitchen faucet reviews show that there’s a variety of styles just within the single-handle category. There is the traditional or straight-spout design. Other than moving the spout from side to side, it is somewhat limiting. It might need a little finagling around large pots. Gooseneck faucets are modeled after the restaurant-type high-power nozzles. These are much taller than straight spouts and have a flexible hose element, such as a pull-out handle. The higher clearance accommodates pots of any size. However, if goosenecks are attached to shallow sinks, you could experience splashing. Indeed, it’s important to appropriately size up the faucet to the sink. A small faucet on a large sink looks as odd as an oversized faucet on a small sink. Regardless of style, an effective faucet should be able to direct water flow to all areas of the sink. Most kitchen sinks are designed with a faucet type in mind, meaning the holes are already drilled out dictating where the parts are to be installed. So, when conducting kitchen faucet reviews to replace an existing one, be sure to choose a new faucet design that will match the existing holes. If you choose one that doesn’t line up, then you may also have to buy a base plate to cover up gaps. When it comes to cost, there can be significant differences in prices, from less than $50 to a couple hundred, as demonstrated by these examples. This faucet is constructed out of solid brass with a triple-plated chrome finish and has a drip-free ceramic cartridge. The gooseneck spout features a pull-down pre-rinse spray function and swivels on its base 180 degrees to make filling pots fast and easy as well as rinsing dishes from various angles to get into their nooks and crannies. It comes complete with mounting hardware and hot/cold waterlines. Showcasing a European style in an oil rubbed bronze finish, this faucet offers a single lever handle that fits on either a single hole or three-hole installation format. It’s also designed to fit standard U.S. plumbing, connections, and hoses. The high spout swivels and it extends for extra convenience. Plus, users can choose between a stream or spray with a push of a button. The spout boasts a reach of 8.125 inches, 2.2 gallons-per-minute flow rate and swivels in all directions. A sidespray hose reaches any places the spout misses. It also offers a PVD finish. According to ConsumerReports.org, PVD, or physical vapor deposition, is one of the most scratch-resistant materials. Finally, the faucet has been rated to meet or exceed CALGreen water conservation standards.